The FT-iZ Hybrid is a triangular head with a stainless steel body. Not only does the triangular shape head raise the MOI in the hybrid, but it also reduces drag for faster swing speeds. The perimeter of the club head has metal injection-molded weights. This further raises the MOI and makes this perhaps the most stable hybrid on the market. 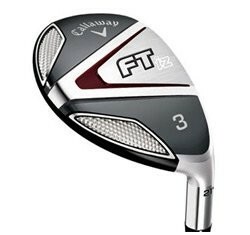 The hybrid has Callaway's VFT. This stands for Variable Face Technology. This gives the face faster balls speeds with a sweet spot that covers the entire club face. And finally, the hosel is offset, giving the higher handicapper more control. I recommend this hybrid for all golfers, especially the mid to high handicappers who are looking for a very forgiving hybrid to add to their bag that will give them tremendous confidence from any lie. For the lower to scratch players, check out the Mizuno MP-CLK and the Titleist 909 H.